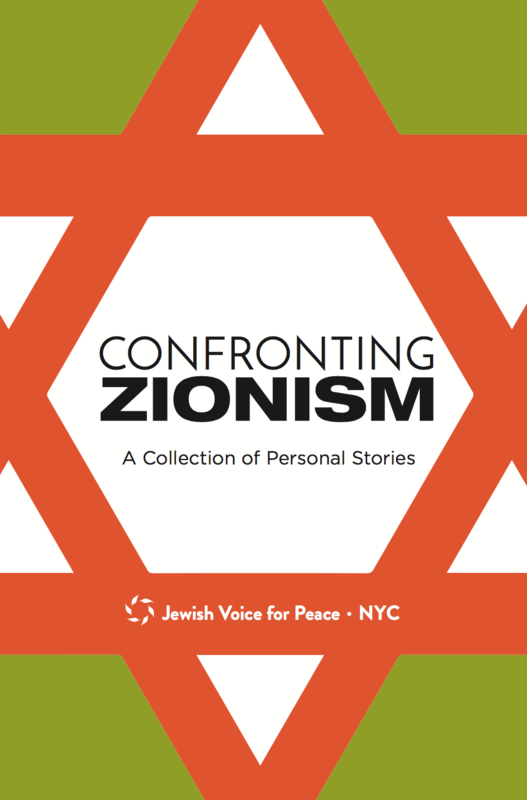 Confronting Zionism: A Collection of Personal Stories embodies a year-long project by members of the New York City chapter of Jewish Voice for Peace. 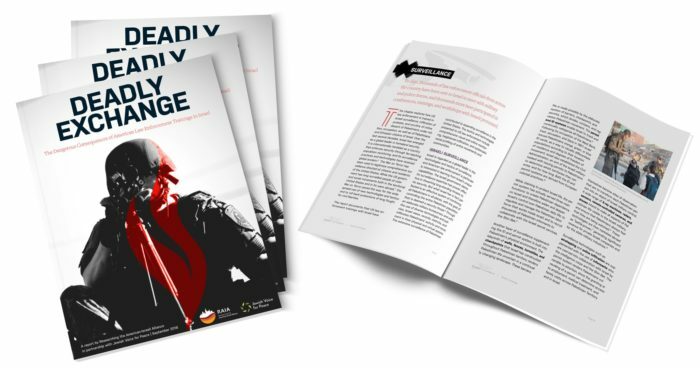 The booklet grew out of a three-part discussion series about Zionism, anti-Semitism, and our own histories of coming to embrace justice for Palestine and questioning mainstream Zionism. It contains thirteen testimonies by JVP members from the New York City area—of diverse ages, backgrounds (Ashkenazi, Mizrahi, Sephardic, Israeli, Palestinian) and genders; a discussion of the project’s rationale in the booklet’s introduction; and an annotated bibliography and set of discussion questions. This is a must read, especially today. Confronting Zionism helps us to cut through the noise pollution that deliberately confuses anti-Semitism and anti-Zionism—a confusion created by Israel’s apologists to justify and excuse its colonialism, racism and apartheid. The world must hear loud and clear the voices of Jews of conscience, such as the contributors to this book, who take a stand against Palestinian dispossession. We must support their urgent call not to let Israel or Zionism speak in their name. Confronting Zionism is a timely, critical presentation of deeply personal experiences with Zionism and the courage of average people to confront powerful and well-resourced narratives aimed at erasing uncomfortable truths. These probing testimonies challenge the notion that Zionist political ideology is synonymous with Judaism, and they expose the incongruity of an ethno-religious Jewish state in a region where millions of indigenous Palestinians long for freedom, human rights and democracy. Must read and must share! Given the hasbara (propaganda) so many of us were told about the history and creation of Israel–stories that neglected to center the Nakba, the expulsion of 750,000 Palestinians from their homes and land–it is our obligation to learn that history, which extends until today, and act accordingly. This collection of stories reflects the unlearning and new learning undertaken to bring the authors to their critical work as partners in the movement for justice in Palestine. I grew up imbued with a strong Jewish identity, a fascination with my family’s Holocaust legacy, and a deep love for and pride in the state of Israel. These three things were totally and inextricably linked. The first two are still at my core. Jewish education, and with it Israel education, were a priority for my parents in raising my two older sisters and me. We grew up attending synagogue regularly, went to Jewish day school for elementary school and in my case middle school, and involved ourselves in Jewish youth groups through middle and high school. At my elementary school, I learned about Tikkun Olam and related social justice principles as core Jewish values. I was taught to value and take pride in the legacy of American Jewish solidarity with the Civil Rights movement; and in the same classrooms, I learned that Palestinian schools taught children that Heaven was beautiful so that they would grow up to be suicide bombers, and that Israel (“we”) kept ceding more land to the PLO (“them”) while being met with greater demands and ceaseless violence. I learned that this was my issue, the current event that affected my life perhaps more than any other. My family also periodically went to visit relatives in Israel, and I celebrated my Bat Mitzvah in Jerusalem. I grew up knowing that Israel was my homeland, that I had deep biblical and historical roots there, and that its existence made me safer in the world – among other insidious mythologies. And though my parents did not subscribe to the extreme right-wing Zionism of some in our community, and did not agree with all of my teachers’ mischaracterizations of the region’s recent history, these core assumptions were never questioned. At home or in school, we never talked about the true lived experiences of Palestinian people. In order to make sense of this handed-down worldview that I held onto throughout adolescence, in order to relate to my school-aged self, I now hold onto memories of moments at which the foundations of my Zionist illusions splintered even slightly. When I was in high school, my family went to visit my sister at college, and sitting in her dorm room I watched her take on my parents in a heated, emotional debate that brought into question the core ideas on which our Zionism rested. On another weekend a year or two later, I was trained in “Israel advocacy” through my youth group. This meant learning a few empty talking points that could be employed in the face of the opposition, who were represented in one training exercise by someone who shouted us down and behaved aggressively while yelling one-line arguments. I later expressed my frustration to a friend: “What if they aren’t yelling in your face? What if they have valid points? In late high school and early college, I began to feel—rather than understand—that I leaned further left on this issue than my childhood friends or the groups like J Street that existed on my campus. I was (and still am) fortunate to know that my older sisters, my most trusted political and ideological guides, disagreed with our upbringing. I was too intimidated by my own ignorance to attend a Students for Justice in Palestine meeting, or to ask my sisters for resources. And though they were careful not to impose their views on me, I trusted their support of the BDS movement (which just made clear sense to me, even then) and, later on, their appreciation of Jewish Voice for Peace. After my freshman year of college, I spent a month in Israel and visited the West Bank for the first time. My group toured the Palestinian town of Susya with Breaking the Silence, heard from Susya residents, and later that day saw the hauntingly segregated streets of Hebron. I finally let go of the historical narrative of my childhood education, and began to hollow out my old sense of what Israel and Zionism meant for my life, my communities, and the world in general. I had unlearned enough to distance myself from my past beliefs, but I had not relearned enough to articulate my new ones. I settled into uncomfortable silence. In the summer of 2014, I was an intern at a sexuality education and training organization where I got to do justice-oriented work that I loved with like-minded people. Part of my job was to coordinate the organization’s Facebook and Twitter, so I spent a lot of time on my intern shifts scrolling through various progressive news sources as well as my personal and work feeds. On July 8th, 2014, when Israel launched Operation Protective Edge, I was a month into my internship. From that day on I spent shifts glued to my computer, distracted from my organization’s page by the most recent news, opinions, and heartbreaking stories about the assault on Gaza. My uncertainty abated, my well- cultivated connection to Israel faded into a sense of emptiness, and I woke up as I watched the numbers mount of the Palestinians being murdered in my name. In the face of isolating, useless despair, the cry of “Not in my name” and the JVP community gave me words and action to shatter my lifelong silence and complicity. That summer I, like so many others, felt whatever was left in my carefully constructed illusions crumble and fall away. This story continues in Confronting Zionism: A Collection of Personal Stories.